Vice President Mike Pence sought to portray President Donald Trump’s latest proposal to end a partial government shutdown as a sincere, “good faith effort” to incorporate Democratic concerns into legislation that will advance to the Senate floor this week, in a Saturday afternoon roundtable with reporters. Trump laid out his latest proposal to Democratic lawmakers Saturday afternoon in a televised speech from the White House which includes funding for humanitarian aid, funding for more border patrol agents, $5.7 billion in funding for a border wall, and a three-year legal extension of the DACA and Temporary Protected Status (TPS) programs. Trump’s addition of the latter proposal is the latest effort to try and break a legislative logjam. The proposal however was immediately shot down by Democratic leadership in Congress and was harshly criticized by some immigration restrictionists like author Ann Coulter. Pence declared “this is not an amnesty bill” in response to criticism that the bill offers protections for DACA recipients, but noted that it is a “good faith effort” on behalf of Trump to try and solve this problem legislatively. The vice president dismissed concerns about preemptive statements by Democrats that the bill would not be considered by Democrats, saying that the compromise itself was crafted with moderate Democratic input. Pence said the White House effort would focus on courting moderate Democratic lawmakers, and by circumventing the intransigent Democratic leadership. The partial government shutdown is approaching the one month mark after Democratic lawmakers and the White House cannot agree on funding for border security. Trump maintains that $5.7 billion is needed to build a barrier along the border, while Democrats say they will offer up no more than $1.6 billion. The White House has offered up varying iterations of proposals to Democrats but nearly all have faltered on their face in a matter of hours. 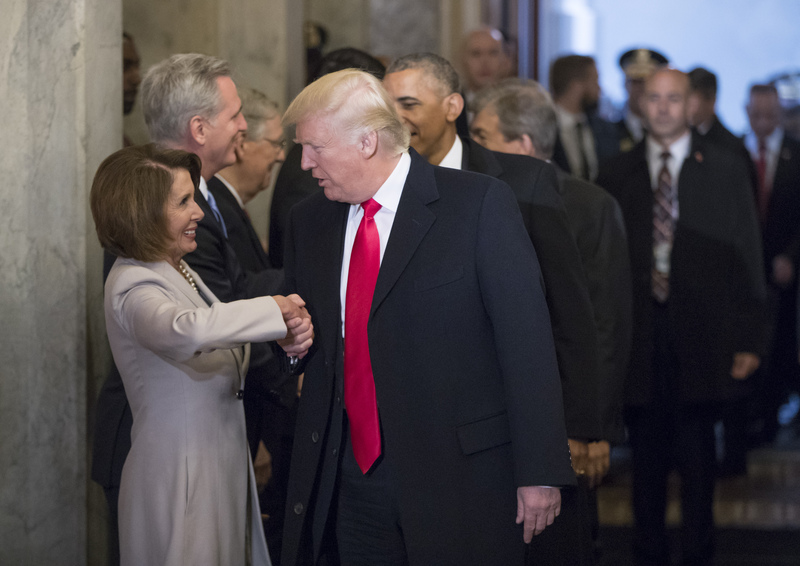 Three separate meetings between Trump, House Speaker Nancy Pelosi, and Senate Minority Leader Chuck Schumer have ended without any deal. Pence told reporters that meeting in particular was the impetus for this proposal to include DACA and TPS extensions. Acting White House chief of staff Mick Mulvaney however told reporters that Trump is still considering declaring a national emergency and using his powers as commander-in-chief to begin wall construction with military funds, but that he prefers a legislative approach.